In our family, everyone loves shabu shabu. For years, The Shabu Shabu House was our Go-To place for special occasions and birthdays. They serve it very simply there. The only choices are beef and vegetarian. But when you make it at home, you can make it with anything you like! This weekend's shabu shabu was an elaborate one, for a birthday celebration. It's kind of like when you go out for Chinese food. The more people you have, the more things you can get. If you haven't made it before, start out simply, choose only a few items to get you acquainted and to insure your success. Shabu shabu is the swishing of the food with ohashi (chopsticks) to cook it in boiling water. 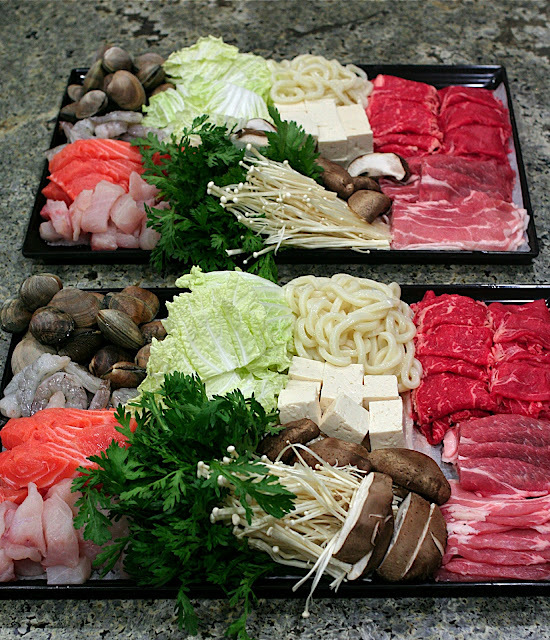 For those of you that haven't had shabu shabu before, you're going to be cooking your own food at the table and dipping it in a ponzu sauce or sesame sauce before eating the meat or vegetables. First, you're going to need a stove & a pot. We use a tabletop butane stove. There are a lot of different brands. You can get them at any asian supermarket, sale prices run anywhere from $25 to $10. The butane fuel runs about $3 - $4. An electric skillet on the table works well too. I have a lot of pots, too, but this is my favorite. 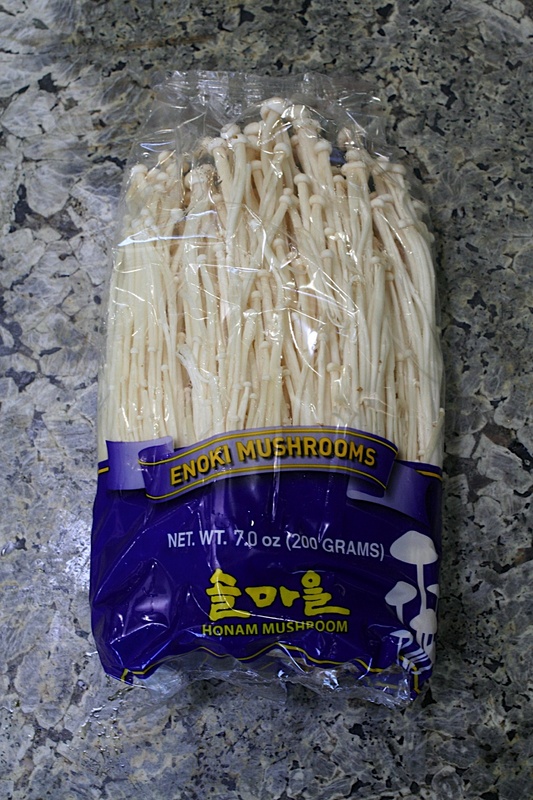 I got it at Marukai, but they don't always have it in stock. Any low pot will work, a skillet will work too. This is the traditional Japanese ceramic nabe--pot. It should be the pot of choice, it's more earthy, but we don't use it much. It's kind of like how you don't use your good china everyday. My least favorite pot is the kind with the chimney in the center. That chimney gets a little bothersome and someone never fails to burn themselves with it. They look great, but the functionality is not our style. Okay. Now that you've got your hardware, you're ready to start cooking. 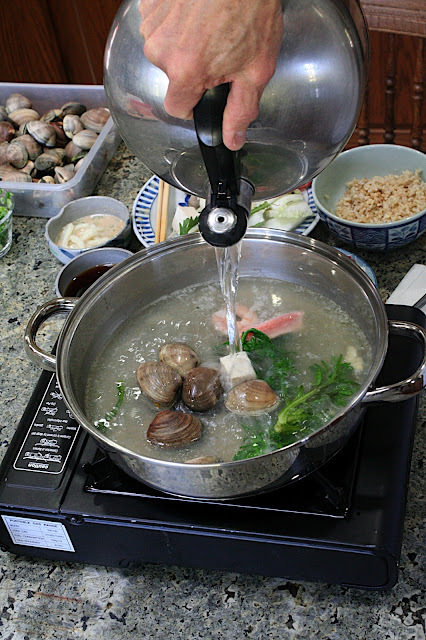 The secret to good shabu shabu is in the sauces. When you go around to a lot of different shabu shabu restaurants, the main thing people talk about is which places have the best sauces. When you make it at home, you can make the sauce exactly the way you like it. That's key. Here are the two sauces. That's chopped garlic that's being added, but that's getting a little ahead of ourselves. The dark sauce is a ponzu sauce and the lighter one is a sesame sauce. They will make a lot of sauce, enough for a crowd (because they will need refills), so you might want to cut them in half. Put all ingredients in a blender and blend until well combined. Make the sauces ahead of time, even the day before. 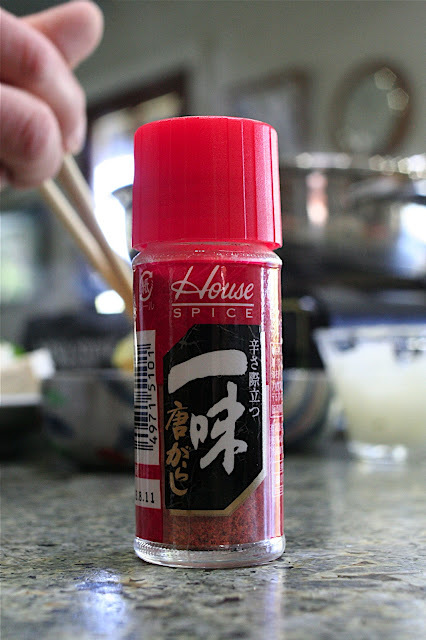 After mixing them, taste them, and adjust the seasoning according to your own preferences. If the ponzu is too sour, add a little more water, if you like the sesame sauce a little more sweet, add more mirin or sugar, etc. But remember, you're going to be dipping food right out of a hot pot, and that will dilute them a little, so the sauces will taste somewhat strong. Next, we're going to make the condiments that will go into the sauces. Grated daikon, thinly sliced green onions & finely chopped garlic are the condiments you can add to your sauces. 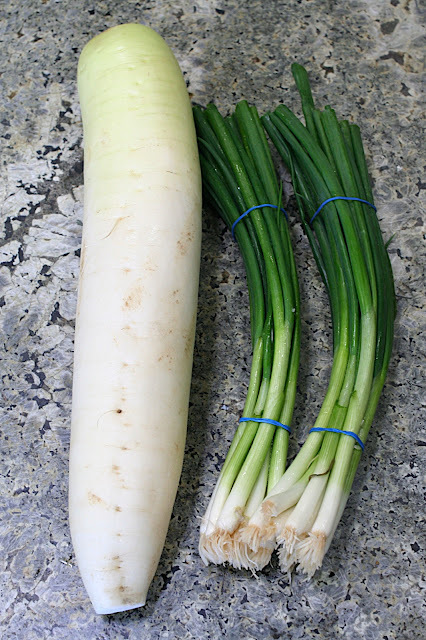 Daikon is a long, white radish. 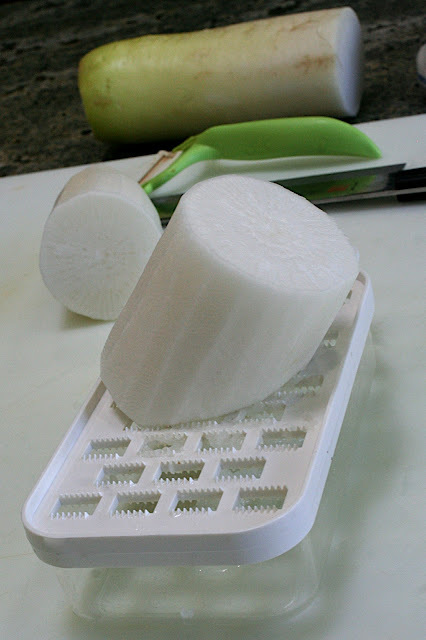 Peel the daikon and cut it into smaller pieces that are easier to handle, then grate them. If you don't have a Japanese grater like this one, you can use a micro-planer. This is Ichimi Red Pepper. It's good in the sauces too. This is the ponzu sauce with condiments added. I like it with daikon, green onion & red pepper. In the sesame sauce, I like green onion, red pepper and a little bit of garlic. Now... What are we going to cook? I bought salmon, sea bass, shrimp & fresh clams at Costco. I was lucky to find two small pieces of each fish. Slice them into bite-sized pieces. 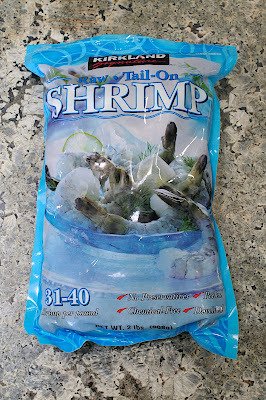 The shrimp is from the frozen section. I peeled a couple of hand-fulls of shrimp. They're already peeled, but I peel the last section and tail off also. If I don't, then I hear a voice in my ear saying, "Mottainai"--how wasteful--when I see those last bites left on the plates. I also bought a bag of clams at Costco. Scrub the clam shells with a brush. Discard any open ones. All of these were good. If you go to the Chinese market, you can buy less, not a big Costco bag. I bought this shabu shabu sliced rib eye at Marukai. It was on sale. I bought a lean one & one that had some nice marbling. The Japanese markets also have fancier meat, artfully displayed and with more fat. It's expensive. And some would say worth it. 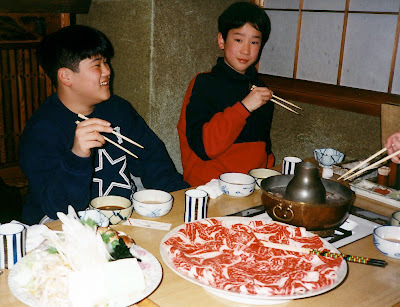 In 1997, on a trip to Japan to visit friends, we had shabu shabu. Look at how much fat is in the meat. The Japanese eat it like that because they appreciate the flavor. And the Japanese in Japan are not fat because they only eat a little bit. I bought some pork too, but it didn't exactly excite anyone, so next time I'm skipping the pork. Wash & cut the vegetables into bite-sized pieces. Cut the shingiku into manageable pieces. Cut the bottom off and discard. Break the tops into small bunches. Okay. Done with the prep. About an hour before your guests arrive, start cooking your rice and arrange your trays. Do I have any snoozers? Add the tofu and udon noodles too. Then set your table with the trays in the center. Traditionally, you're supposed to add some dashi kombu to the water and take it out just before the water begins to boil. Just add a little to the pot at a time. Everything cooks fast, and you don't want to overcook anything. That's what is so good about shabu shabu. You're going to cook everything to its perfect doneness. The clams are done when they open up. You'll need to add more hot water when the water runs low in your pot. And if you're also serving vegetarians, they will be happy with the veggies & sauces! I am always so thrilled when everyone's enjoying their meal. 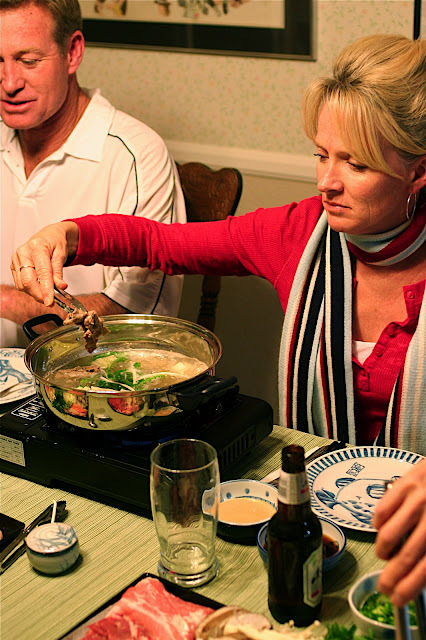 This was Pam's first time having shabu shabu. She really enjoyed all the flavors and the experience! And look what Sue brought for dessert! Sue's going to be a guest blogger! Great post! The Shabu Shabu looks delicious. I'm sorry I missed it. Can I make a request for a future post? I know you have an herb garden that you utilize often. I would be interested to hear what herbs are best to grow at home rather than to buy at the store. I enjoy basil on lots of different meals and having a fresh supply on hand seems like a good idea if it isn't too hard to take care of. I wish I was there :( looks soooo good! Ahhhh, brings back old memories. 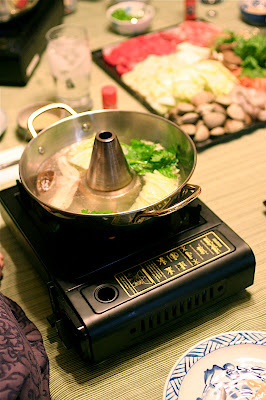 When we were little we use to do Chinese Shabu Shabu in Hong Kong. We would have the best time, and at the end, we would drink the broth. and if you write "your" when you really mean "you're" then you're writing it wrong. Hi Karen's mom, I love your blog on shabu-shabu. Karen came over to our house for a shabu-shabu dinner with my daughter-in-law, Grace when they attended Pepperdine. We loved meeting Karen and will see her this weekend at my home for Grace's baby shower. I'm glad Karen suggested I look up your blog. I'll definately be a follower. Keep up the great work. My hunch was correct. Aaron loves your sauce recipes. Our tummies are now full (and sorry to say, more than 80% full!) of your delicious Shabu Shabu recipe we made tonight! Gochisoosama deshita! I, too, am looking forward to your tips on home-grown herbs! 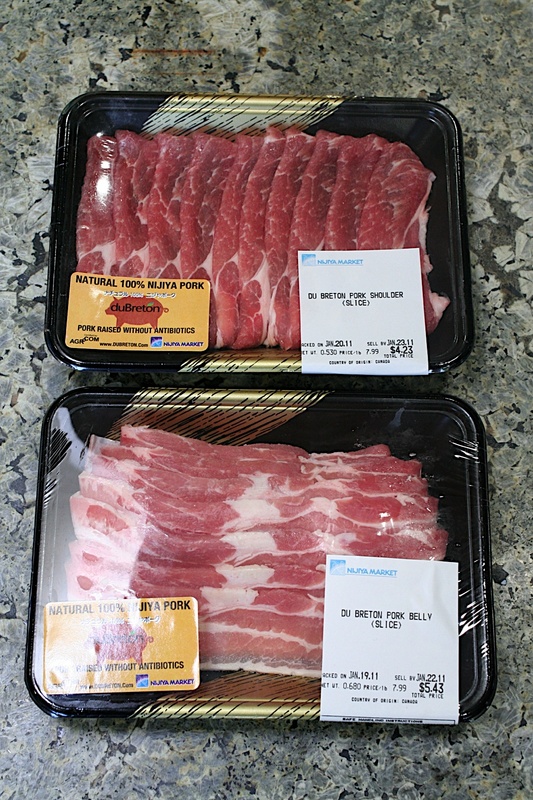 Love this - I saw thinly cut shabu shabu ribeye at a Japanese supermarket, and I made it an impulse buy. I used commercial ponzu sauce just because I had some around, but I made the sesame sauce using your recipe and my girlfriend and I loved it! I'll have to look for the shingiku next time -- I've never had it before. Thank you for your informative post. My husband and I just got married January 1st. He had had shabu shabu when he was in Japan several years ago and he introduced me to it recently. It is already one of my favorites! We were at a shabu shabu restaurant last night and discussed the possibility of making it at home so we can have it more often. I was researching it online and stumbled on your post. Thank you for providing such careful instructions and beautiful photographs so we will be able to make shabu shabu at home too! $4 for rib-eye shabu meat? That's insane... it's $10 where I live.